There are tens of settings you can use for the function. But usually we are interested in the url. The new syntax of jQuery ajax recommends everyone to use Promises. Which gives the function multiple callback options, like done and fail. 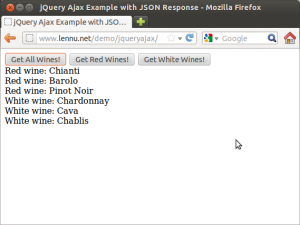 In this example I will show you how to do Ajax with jQuery and how to process multidimensional JSON data table coming in through Ajax. You can test this example at https://www.lennu.net/demo/jqueryajax/. We will start with HTML skeleton with jQuery already embedded in it from Google. Inside HTML we have three buttons, these buttons will be used for getting different kind of wines from our serverside. There is also a div where the wines will appear after being fetched from serverside. Basically we have a submit event that fires when a button is clicked. Next we take the value of the button clicked and send it to serverside.php with jQuery’s ajax()-function. From this function we get back our JSON data which we’ll process on success. After that it’s simple if and else to append our #wines div. Add this to the HTML Skeleton in HEAD section. Now we need the serverside where Ajax will connect, create this file by the name of serverside.php if you wish everything to run smoothly. This simple php gets clicked buttons value sent from our Ajax-function. After that we create a multidimensional data table. Finally we do a PHP’s JSON-encoding and if else the right table to send back to Ajax. These codes will produce a working HTML site with jQuery doing some cool Ajax! You can use them as a skeleton when you are building your own Ajax based website.